Here are 3 keys that will help you become a more consistent driver of the golf ball. One thing you’ll see if you go on the driving range is the tour pros always work on their setup, ball position, posture, and they also are always constantly working on their rhythm. So, those are the three keys I’d like to touch on. I’ve got an alignment rod indicating my target line, and then perpendicular to that, I have another golf shaft that’s going to help me see where my ball position is. So, it’s important, at least to start out, to play this driver a little more forward in your swing. You can see it’s off my left heel. Now, that may work perfectly for me. Some of you out there, it might be better if you’re an inch behind that. Maybe some, a couple of inches in front of it. But, this is the reason we want to set up a little bit of a workstation, so we can see what works best for us. Another big factor is posture. I think, a lot of times, people get a little sloppy with their posture, so watch the video to see my thoughts on posture. Once I’m set up with good posture, I’m just going to make a swing. What I like to do is make these swings with this kind of rhythm because it gets everything in sequence. Particularly with the driver, we see a lot of people get up to the top and they’re very quick, and just that kind of quick motion can throw the whole club path off, and the chances of hitting a good straight shot are really minimized. So, again, good posture, ball position is off my left heel, nice light grip pressure, and I’m just going to hit this ball 150 yards in the air. And you can see that they’re dead straight. From there, after doing that a few times, and when I say ‘few’, I think I’ve done this as much as a whole practice session, just trying to get my rhythm and get my sequence right, I’ll try to increase the speed just a little bit. This is a great exercise for you to become aware of what your club’s doing in the swing. I think it’s important that you kind of have that feel of what the club head’s doing. Now, the reason I think it’s important for us to have this shaft down here to do ball position is you can kind of self-correct your mistakes while you’re practicing. 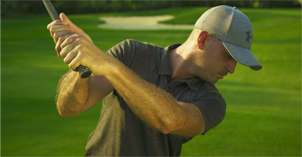 If your tee shots, while you’re doing this drill, constantly are going off to the right, you may want to take the ball position and move it forward, which will allow that club a little bit more time to square up. So, now I’ve got the ball positioned more off my left instep, and when I do that and make my swing, that ball will start a little bit left. In that particular case, it cut right back to the target line. 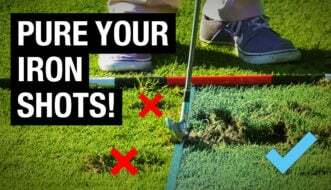 If your tee shots, and this is a problem for a lot of players, if your tee shots are starting left and slicing too much, then we want to maybe move the ball back in our stance, so you can have the feeling of coming in to out with your path. Watch the video to see all of my tips for consistent driving. Practice Feel To Strike Your Irons Pure Every Time!